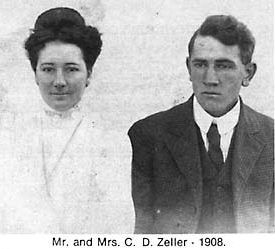 "Dubbs Zeller (named after Bishop [Rudolph] Dubbs [of the Evangelical Church] came from Mt. Cory, Ohio, with his parents, Jacob and Eve, and five brothers, to file on a homestead – NE 16-19-16 W3rd in 1907. They came because of the free land and their dad had only an 80 acre farm at Mt. Cory and had nothing to offer his sons. Before coming to Canada, the boys who were old enough worked in the oil fields at Bakersville, Oklahoma – then Indian Territory. Edna Sarah (Wright) came from New Madison, Ohio, with her family and sister Nellie May. They came by train in 1907. The girls stayed with Henry and Lizzie Baker, as the little Wright shack was too crowded. The morning after they arrived at the Baker farm, Mr. Baker had to dig from the house outward because of very heavy snowfall during the night. Mom and dad were married on October 27, 1907, in the parlor of the Imperial Hotel in Swift Current and went to live at Half Circle Six in Keithville. They stayed at first with dad’s parents, until a house could be erected. Their first child was born – Doratha Della on July 24, 1908 – she was born in the basement of Jacob’s [Dubb’s father] house which served as kitchen and one bedroom. The other bedrooms were upstairs. Eve Zeller acted as midwife. She [Doratha] was the first baby born north of Swift Current and was quite a novelty to all. 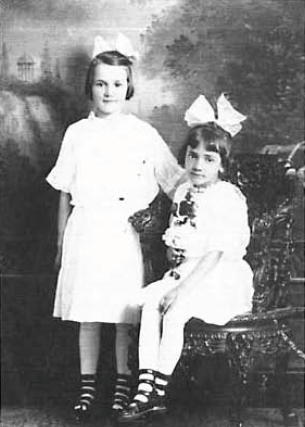 Doris Elizabeth arrived on November 30, 1910, delivered by her dad, Dubbs, before Doctor Kelly could get there. She was supposed to be a boy, of course, so surprised everyone. Pioneering on a treeless plain was quite different from the heavy tree growth where they had come from, but before long they were too busy to miss their former homes and were busy making their own home. Those first years found them eating such things as porcupine meat or gopher legs, when meat was scarce, and pig weeds for spring salad, and of course, there was always “sour gravy.” Farming was done with broncos, and early transportation was by wagon and later by surrey. Life was not all bad, as ther were plenty of get-togethers for debating, singing, taffy pulls, pie socials, box socials, picnic, ball bames, and every Sunday, Sunday School and Church. We remember our parents telling about the threatening prairie fires. You were never without matches in your pocket, so that if you were caught without a way out, you could start a back fire. The North West Mounted Police came through every week or so just to check and sometimes get a free meal. The bachelors were really good and when the men folk were away to Swift Current, which always meant being away over night, the bachelor men would appear to help with chores getting in coal and water and/or babysitting. Horses were replaced for farmers in the 1920’s by tractors and combines for harvesting and all machines were modernized. Our parents farming as pioneers worked side by side throughout their working years. Mom worked in the fields alongside dad, driving four or six-horse teams and he did his share in the house, especially in winter time. He could bake wonderful bread, made butter, pies, etc., as well as sew a good seam. In 1942, dad bought the half section of Cormack land and for years farmed the quarter of land that belonged to Francis Zeller. Our memories of being home was always the water problem. The original well was a very deep one; with a sandpoint and wooden rods which we were always having trouble with. Our home was very happy and our happy times many. Having five married uncles on the Zeller side so close by and three uncles and an aunt on the Wright side, plus wonderful neighbors, found our home seldom without friends or relatives in it, unless we were at their places. In 1944, our parents moved into the Village of Pennant, and in 1960 they retired, renting the farm to their grandson, Don Thomson. Dad died September 9, 1962, and had never been in a hospital before that time. Mom died April 18, 1967. Both were tough pioneers and saw many dreams fulfilled and some broken."